Just up the street from 114 Catherine and a couple blocks from 202 Eddy is 140 College Avenue, also known as the John Snaith House. 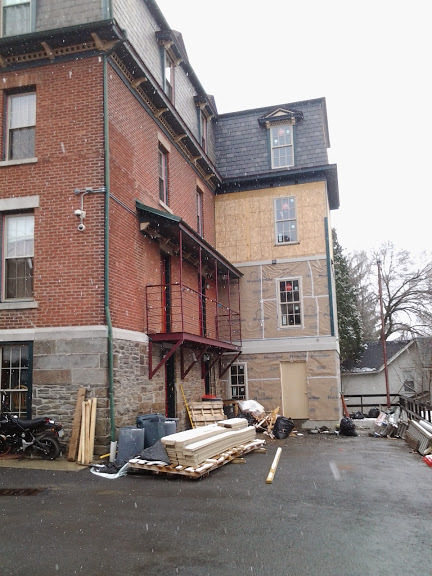 Since last fall, work has been underway on a 3,800 sq ft, 12-bedroom addition to the 1874 structure. John Snaith was an English builder, stone cutter and architect who came to Ithaca in 1869 to do work on Ezra Cornell’s Llenroc mansion (under construction at the time) and other buildings for the nascent university. Snaith lived in Ithaca for over a decade. He built the original Ithaca High School (destroyed by fire in 1912) and did work on the Sage Mansion, where he was fired by the ever-impatient Henry Sage. 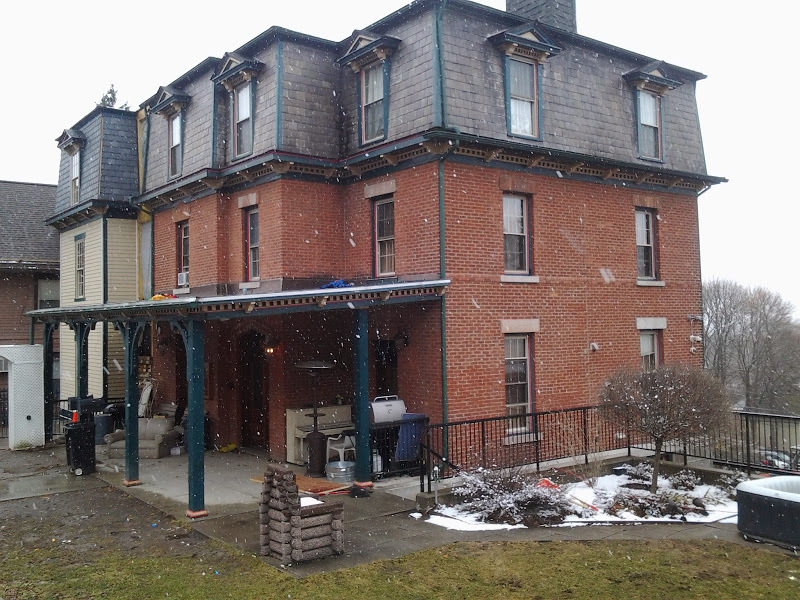 After Snaith moved to Albany, the house was used as a boarding house, a B&B in the 1980s, and a private single-family home. The house was rented out to a landlady and her boarders when it was partially destroyed by fire in 1894. Snaith rebuilt the home shortly before his passing in 1896, but redesigned the top floor with mansard trusses and added dormer windows. Today, it’s student-oriented housing. 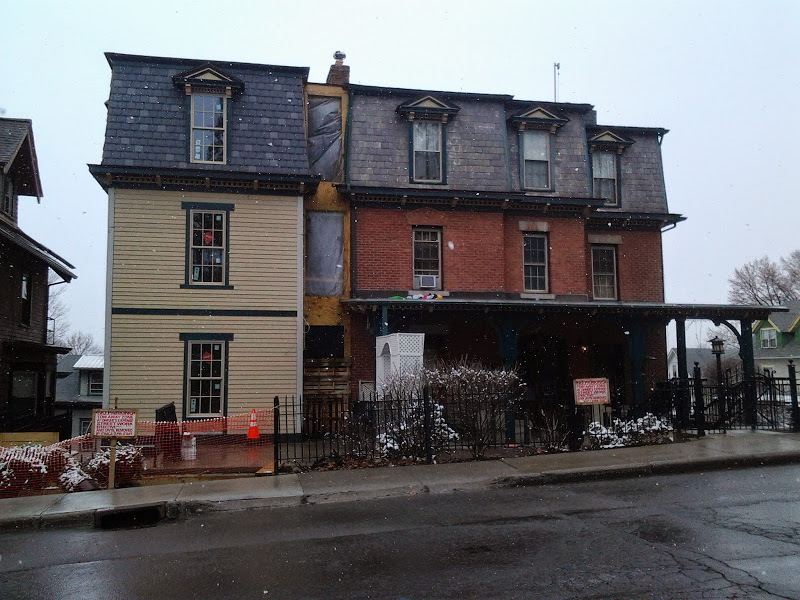 The addition is a sympathetic design approved by the Ithaca Landmarks Preservation Council (the house was designated a historic structure in 2011), separated from the original house by a glass “hyphen” connector. 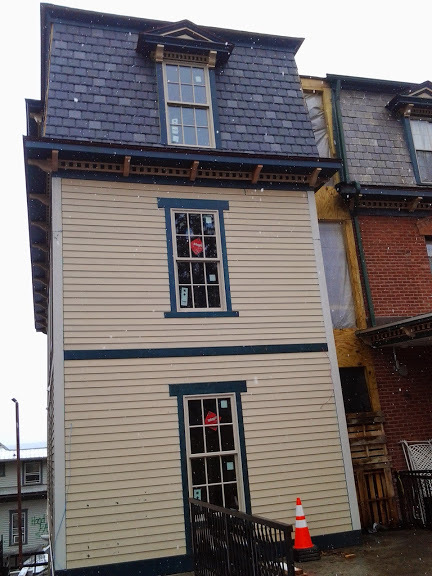 In the photos below, lap siding has been installed on the street-facing east wall, and uncovered plywood and house wrap can be seen in the rear. 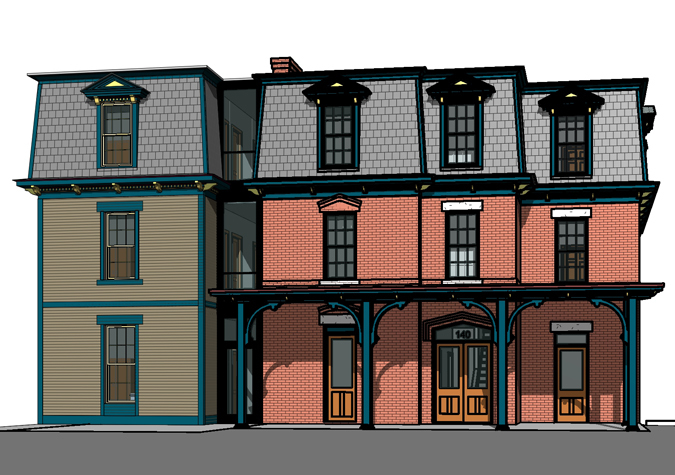 The slight variation in the mansard roof tiles are a nice touch. 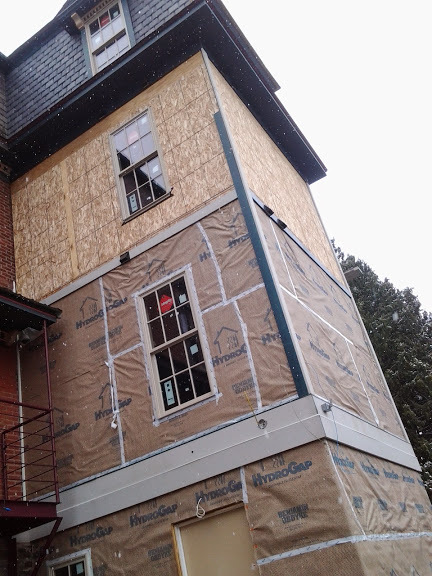 Windows have been installed, and I’d venture a guess that interior framing is complete and rough-in (plumbing, electrical) is underway in the addition. The project is designed by local architect Jason Demarest and developed by Po Family Realty, a smaller Collegetown landlord. None of the larger projects in Collegetown are underway just yet, but that will likely change when their current tenants’ leases are done June 1st. The following year or so should be very hectic in the neighborhood, with 307 College (96 beds), 327 Eddy (64 beds) and 205 Dryden (40 beds) all expected to start this summer, and Collegetown Terrace expected to start construction of its 300+ bed phase III this year. A quick check of the neighborhood showed that construction has not yet started on two other small projects, the 6-bedroom duplex planned behind 424 Dryden and the 18-bed 3-building project at 804 E. State Street. I wish they hadn’t chosen cheap vinyl siding for the facade. The roof on the new segment matches well, but the corporate beige siding clashes horribly with the red brick. The Landmark Preservation Council could have at least demanded a more harmonious color. I agree. I think the logic here was to clash with the brick deliberately in order not to disturb its “historic” nature, but they’ve wound up creating an addition that looks like it was an original part of the building that’s just been shittily maintained with vinyl siding. I guess it matches the “Collegetown vernacular” now – a nice brick house never fit the “character of the neighborhood” anyway.